We were all set to head out on morning drive, when it started pouring with rain. Wet weather tends to restrict the game viewing somewhat, as the animals are inclined to seek shelter and guests are understandably hesitant to go outdoors. We decided to visit the Hoedspruit Endangered Species Centre instead, hoping that things might be a little drier over there. On our way there we came across two adult leopards. Leopards are solitary animals by nature, so this meant only one of two things. They were either fighting or getting ready to mate. And since it was a male and female, we figured it to be the latter. There was a lot of hissing, spitting and growling from both parties, although this aggressive ‘getting to know you’ behaviour is quite normal between leopards. Especially leading up to the ‘big event’. 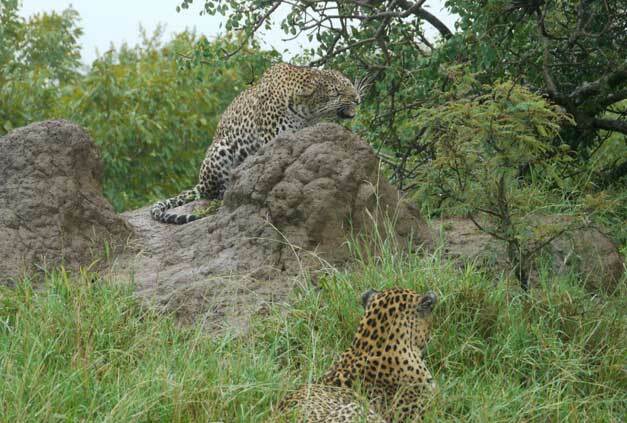 After waiting patiently for what felt like an eternity, the leopards finally mated. That day we saw something most people only dream about, and on a rainy day to boot.